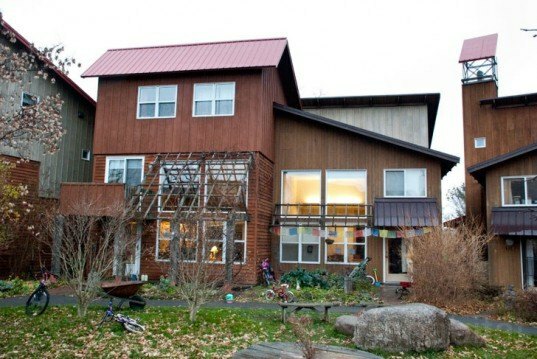 Hidden away in the Finger Lakes region of upstate New York, EcoVillage at Ithaca offers an alternative model of living. An intentional community and non-profit educational organization, EcoVillage provides the setting for a healthy, socially rich lifestyle focused on minimizing the ecological impact of humans. Envisioned in 1991 and brought to life in 1996, the community has grown and a third village is now in construction to accommodate to a flourishing demand for more sustainable living options. Joan Bokaer and Liz Walker were the founding co-directors of EcoVillage Ithaca. Inspired by co-housing projects that appeared in Denmark in the 1960s, the two were drawn to the balance of having a rich family life while also enjoying a social community. Their efforts have led to a 175-acre sanctuary that boasts two community supported agriculture (CSA) farms and 160 residents, 60 of which are children. The two existing neighborhoods, FROG and SONG, were designed under the direction of architect Jerry Weisburd and permaculture designer Dave Jacke, respectively, to inspire social interaction. Walkways and lawns unite the 30 housing units that comprise each village and a small road is restricted to the outer perimeter. Children can play outside with few worries and a Common House offers several communal meals a week and a play area for kids in the colder months. There is also a swap room for clothing, a laundry room that residents sign up to use and several office spaces. Some basic design principles make EcoVillage sustainable. On average, residents use 40% less energy than other middle class U.S. households. Simple choices such as low-flow toilets and faucets, radiant floor heating, rainwater catchment systems and compost toilets in some houses help reduce resource consumption. Clustered groups of houses allow for shared heating systems and a series of closely packed duplexes enhance heat maintenance. Passive solar considerations are also important. Triple-glazed large south-facing windows help trap heat in the winter and a trellis lined with grape vines offers shade during summer months. Double wall construction composed of dense pack cellulose, structural insulated panels (SIP) and wood frames make houses energy efficient and well insulated against Ithaca’s cold winter weather. While small, averaging 1,228 square feet compared to the US average of 2,230 square feet, the double-storey house design creates a sense of space. Each village’s Common House reduces the need for communal space or guest rooms in individual family homes. Communal meals offered three times a week cost $3 and are attended by about half of the residents. Rather than 30 stoves being lit and 30 individuals going on separate shopping trips, the meal can be accomplished using one to two stoves and groceries are purchased in one shopping trip, reducing transport costs and energy usage. 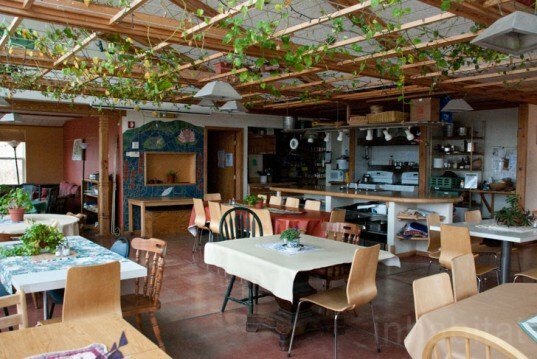 With advancements in technology and recent New York State tax incentives, EcoVillage has increased efforts to reduce their community’s ecological footprint. 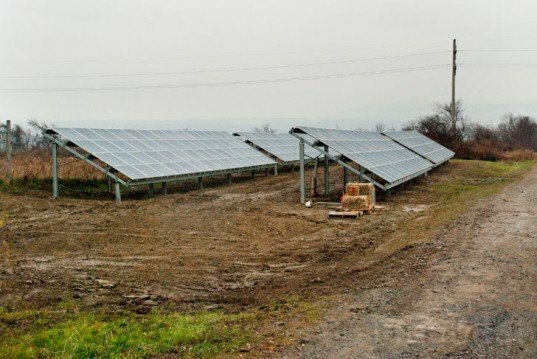 Several FROG residents recently invested in a community scale solar electric system that is expected to pay off in 11-15 years. 224 trina solar panels were installed that are expected to generate 60,000 kilowatt hours per year, offsetting about 60% of resident energy usage and reducing carbon dioxide by 250 tons. With energy costs on the rise, the new system insulates residents from cost fluctuation and keeps money within the community. 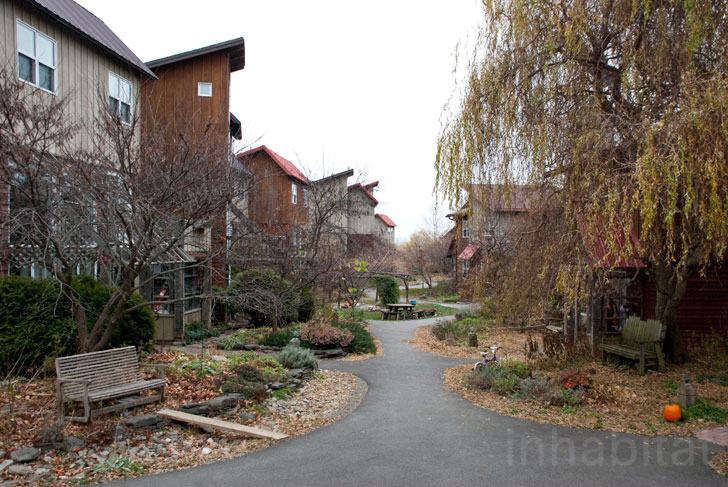 EcoVillage’s success over the years has prompted the construction of a third village, TREE. Still in the planning stages, the village will include 40 units, 15 of which will be apartments housed within the common building. Accessibility, affordability and sustainability are key components in the new community. Studio apartments start at $80,000 and bigger houses are priced up to $250,000. Aging in Place options such as staircase free designs will make houses accessible to both the elderly and handicapped. With 13 certified passive houses in the US, Walker explained, “we want to build 25 more.” All houses will have solar heated water and PV panels as well as a heat recovery ventilation system (HRV) to provide fresh air and improved climate control. The non-profit Center for Sustainable Education that is also a part of EcoVillage strives to offer educational opportunities to the community at large. The Groundswell Center for Local Food and Farming offers summer courses open to anyone and regularly hosts tour groups, students and the media. The Center has also received a grant to reflect on EcoVillage’s 20 year history and develop a guide for mainstreaming sustainable design aspects into standard planning models. In a further effort to raise excitement for sustainable living alternatives, EcoVillage Co-founder Liz Walker has already published two books that relate her experience- EcoVillage at Ithaca and Choosing a Sustainable Future: Ideas and Inspiration from Ithaca. With increased attention on global warming and sustainable lifestyles, Ithaca’s EcoVillage offers people the opportunity to become part of a growing community of concerned individuals. “We’re trying to create demonstration projects that hopefully other people can be inspired by,” explained Walker. So far, they seem to have accomplished this with two-thirds of residents coming from out of state specifically to live at EcoVillage. For those who have ever been curious about living in an intentional community focused on sustainability, now is the time to act as spaces are still open in the new village! AMAZING! This is what I have always been searching for; not to mention that I LOVE Ithaca! A small road restricts cars to the outer perimeter of the villages. Children can play outside with few worries and a Common House offers several communal meals a week and a play area for kids in the colder months. A one-acre pond provides the perfect place to swim or ice skate and see wild life. Clustered groups of houses in the SONG village allow for shared heating systems and a series of closely packed duplexes enhance heat maintenance. Triple-glazed large south-facing windows help trap heat in the winter and a trellis lined with grape vines offers shade during summer months. While small, averaging 1,228 square feet compared to the US average of 2,230 square feet, the double-storey house design creates a sense of space. Each villageÕs Common House reduces the need for communal space or guest rooms in individual family homes. Pictured above is the FROG Common House. Communal meals offered three times a week cost $3 and are attended by about half of the residents. The villages each occupy about three to five acres. Several FROG residents recently invested in a community scale solar electric system that is expected to pay off in 11-15 years. 224 trina solar panels were installed that are expected to generate 60,000 kilowatt hours per year, offsetting about 60% of resident energy usage and reducing carbon dioxide by 250 tons. Residents are engaged in an array of sustainable initiatives and come from as far away as Brazil and England to join the community. Most people own their houses however some are occasionally for rent. The Groundswell Center for Local Food and Farming offers summer courses open to anyone and regularly hosts tour groups, students and the media.